Preheat oven to 350 degrees F. In large mixing bowl, beat hot sweet potatoes with butter until smooth. Add remaining ingredients except crust; mix well. Pour into pie shell. Bake 40 minutes or until golden brown. Cool. Garnish as desired. Taste is wonderful! The only reason that I gave this recipe a four star instead of five is the amount of sweet potatoes can vary. I would prefer a cup amount of sweet potato ie: 2 cups. This is a wonderful pie. 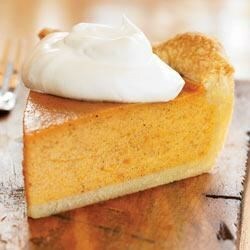 We used home grown sweet potatoes and topped the pie with 1 pint sour cream plus 4 tbsp sugar and 1 tsp vanilla.